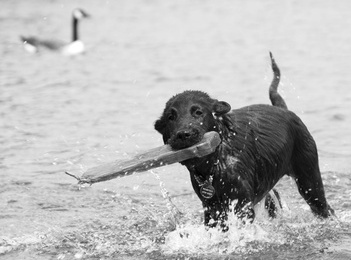 Follow these seven Labrador Retriever training tips if you looking to train your Lab? Labrador Retrievers have a happy, playful, and independent personality, and if you aren’t careful with early training, you could end up with a lightning bolt and speedy dog that is definitely on their own program. Early training is essential in any dog but especially so in the case of the curiosity-filled Labrador. Because of the Labrador’s love of play and energy, and it doesn’t seem to matter whether it’s a puppy or a full-grown Lab, they need to have some boundaries set. Great family dogs because of their friendly attitude, if you don’t train your Lab puppies early, you could end up with a Labrador like my Abbie! Abbie is definitely on her own program and if I want her to come a barrage of “Abbies” will not make her come if she is happy where she is. As soon as your bring home your Labrador puppy make sure you have set aside an area that is just for him. Keep recommended toys that aren’t too small for him to swallow in his space as well as a crate with a blanket where he can feel comfortable by smelling his own scent at sleep times. Never just let the Labrador explore the home alone with no supervision. Not only could a puppy get hurt, they can chew and claw things you may not want them to. Good supervision and gentle correction is key. This goes for outside as well. Too many puppies left alone can get caught in fences and chew wires that could harm them. Before you leave the breeder with your new Labrador puppy, ask the breeder what food they used. If you can, try to keep your puppy on the same diet. If you have more than one dog and you want to switch your Labrador to the same food as all the others, do it gradually so their tummies don’t upset. You may be surprised to see this in our list of top Labrador retriever training tips because so many new puppy owners feel the crate is an evil or mean way to house train a dog. This is so untrue. In fact, our Labrador Abbie at age seven still sleeps in her crate. Every year I try to take it down because it is so large and takes up a lot of room, and she wanders everywhere looking for it. Puppies, just like humans find a sense of security in crate training and most dogs will not “go” where they sleep. Try it, and ask your veterinarian about the method if you are still unsure. 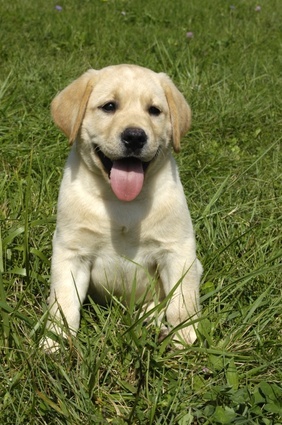 When correcting or giving your Labrador puppy reinforcement or correction, use a good voice and be positive. Never yell or hit your puppy. In fact, out of all of my four dogs, Abbie, who is the Labrador, actually gets upset if she hears a voice that is loud and tries to seek out the voice and calm it. Be calm yet assertive with your puppy. To effectively train your puppy whether you are leash training him, setting boundaries or helping introduce him to his new dog friends, try not to make your training sessions too long. It really isn’t that the puppy will be bored, but because Labradors are so curious, they may just want to do something else! Let him explore and be a puppy every now and then as long as you use good supervision. Beating, hitting, or smacking your Labrador puppy will not make him listen. When it’s correction or punishment time, use commands you teach him and be sure you voice tone is firm and sharp. As your puppy grows, the most intense restrictive training he will need is only a tug on his collar or leash to take him out of his behaviour. Labrador Retrievers are easy to train, if you start early. Don’t wait until you Labrador is older, although if you adopt and older Labrador, you can train them as well if you just put a little work and patience into it. Amazingly, in both the US and the UK, 6 out of every 10 dog owners have Labradors! That says something right there about their temperament and joy to own as pets. Be good to your Labrador and use these training tips for success.